"Some girl monsters don't play nice!" Volume 4 of Monster Rancher picks up right where Volume 3 left off, with Genki and his pals crossing Heaven's Canyon in a hastily put together balloon. Just as they were told, the other side of the canyon holds slave camps where humans are forced to dig up Mystery Discs for Moo's army of monsters. Genki decides to help out the slave humans, but they don't want to help themselves since they fear the retribution of one of Moo's main generals, Pixie. Regardless, Genki still thinks he can frees the people, but in the process, he winds up making things worse for them after a short uprising.Eventually, even Suezo, Holly, and the rest of the good guys get captured, and Genki winds up the only person who can help any of the captured souls. He tries to talk sense into Pixie, but she won't listen to reason, and still presses on trying to destroy all those who oppose her. Worse yet, Pixie controls a powerful Golem who's more than an equal for Genki's Golem friend. Eventually in their struggle, Holly and the rest manage to uncover a Mystery Disc of their own. When they unlock it, it becomes a Monol (short for Monolith), a mysterious being that lives only to tell a story with which it has been programmed. Genki's crew decides to listen to Monol's story, in they learn of a forgotten past to the world when an advanced culture, much like modern day Earth's, developed the process by which monsters were transformed into Mystery Discs. In this age, when war began, scientists developed Moo as a weapon who then went vastly out of control. The Phoenix, for which Genki is searching, was created to stop Moo, which it did, but only to an extent. Moo's consciousness still lives and that is what creates the evil in the world as it exists in the present.For the first time in the series, the episodes start to become heavily reliant on each other, with linear storylines developing. The battle against Pixie actually is a two-episode affair, but it marks the first appearance of one of the major villains in the story, which is a welcome change from the generic foes thusfar. The backstory provided by the encounter with Monol is actually an interesting, if not grim, bit of depth to the quest that I personally didn't expect from a show with such juvenile sensibilities. Of course, at this point, most cartoons, regardless of their origin, would probably get a bit wrapped up in their dark nature and start becoming angst-filled. With a cast of young monsters and children, though, there's a bright optimism that never dies. I suppose that was the creators' intentions, and certainly it helps Monster Rancher along into future quests. Image Transfer Review: The digital animation looks as sharp as ever, and there are no transfer issues. While there are some 'rainbow', moiré effects along sharper edges and in dense patterns, this seems fairly typical of this kind of digital cel-work. Audio Transfer Review: The audio is quite full and energetic. The 2.0 Surround track (with no surround effects) delivers a lot of action when the scenes call for it, and really fits the general mood of the show. It's a solid mixture of subtlety and impact, which may sound odd for a basic cartoon, but the disc really works. Extras Review: The disc contains no supplemental features. As usual for Monster Rancher volumes, the disc uses 5 chapter stops. 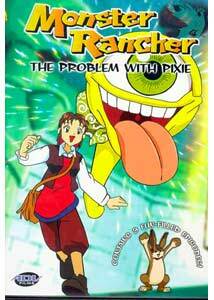 The more I watch Monster Rancher, the more I wish a slightly better version of it was released, specifically with original Japanese dialogue and uncut episodes (if there were any cuts). As it is, this is a pleasant series.